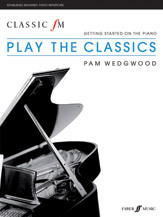 Classic FM: Play The Classics is a great collection of popular classics in easy-to-play arrangements. The pieces are progressive and gradually extend your technique, including favorites such as GymnopTdie No. 1 (Satie) and Waltz from Swan Lake (Tchaikovsky). Suitable for those who have learnt for approximately one year, or completed the Classic FM: Getting Started On Piano method. Titles: 1.A Musical Joke (Mozart) * I Vow To Thee, My Country from The Planets Suite (Holst) * La Donna E Mobile from Rigoletto (Verdi) * GymnopTdie No.1 (Satie) * Prelude In C from Twelve Little Preludes (JS Bach) * Romance from Piano Concerto In D Minor (Mozart) * Arioso (JS Bach) * Symphony No.40: Theme (Mozart) * Pavane Pour Une Infante DTfunte (Ravel) * Waltz from Swan Lake (Tchaikovsky) * Che Far= from Orfeo Ed Euridice (Gluck) * Clair De Lune (Debussy) * Chorus Of The Hebrew Slaves from Nabucco (Verdi) * Pavane (FaurT) * Rondo Alla Turca (Mozart) * Polovtsian Dance (Borodin) * Au Fond Du Temple Saint from The Pearl Fishers (Bizet).